Fans of Bollywoood musicals at any time during the more than three decades between 1963 and 1998 are more than familiar with composers Laxmikant Shantaram Kudalkar and Pyarelal Ramprasad – better known as the composing duo Laxmikant Pyarelal, or simply LP.Â The prolific scoring duo shot to fame in the 1960s, specifically in 1964 after a low-budget film they provided music for – Rajshri Production’s Dosti – won them the Filmfare Best Music Director’s award amidst a field of tough challengers. From that moment on, Laxmikant Pyarelel went on to become one of the most prolific film composing duos of all time, scoring 44 movies in the years between 1966 and 1969 alone. In the 1970s they composed music for more than 150 films. And now Times Square Records is releasing a 2-disc collection including 28 of the famed duo’s tracks with music arranged chronologically from 1963 (the slightly scratchy sounding “Hansta Hua Noorani Chehra (That smile-lit face)” featuring the inimitable Lata Mangeshkar to 1991 (the electrified, surround-sound enabled “Jumma Chumma De De (Jumma, give me a kiss)”. As the tracks flow past, so do the years and the slow transitions made by Laxmikant Pyarelal over the years to stay contemporary are readily evident. Anyone looking for a thorough sampling of Laxmikant Pyarelal’s music should look no further. And for die-hard fans, the opening track on the second disc, “Soul of Bobby – Part 2 (excerpt),” is presented here for the first time legally on CD, taken from their often bootlegged cult-favorite album The Soul of Bobby. With over two and a half hours of music spanning several decades in Bollywood, this collection manages to provide a constantly varying sensibility while still feeling like a grouping of related music. Collectively, these tracks represent an impressively expansive career in film music by a dynamic composing duo. 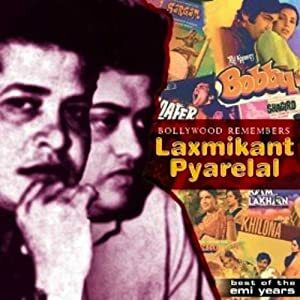 4 users commented in " Music Review: Bollywood Remembers: Laxmikant Pyarelal "
LP duo were excellent composer the Indian film industry has ever seen. Songs composed by them are even remembered by me till today. No other composer after 1990 has scored good music as they could do. They were very brilliant and they could provide music to every situation that needs.Songs from film “Bobby” are still romantic and one can not forget those songs. If oscar could have been given to a very good music he deserved for several films, Bobby, Dost, Dharam Veer,Sargam, Naseeb, Dostana. I appreciate both of them very much. Laxmikant pyarelal is the no.1 composer when compared to any composer in india. Their talent is unbeatable. They could have got atleast 20 Occar awards for the songs they had contributd to indian music. Their talent is like that. One can not forget their composition in films like Bobby, Sargam, Dharam Veer, Roti kapada aur makan.I feel very sad why they have not been awarded with Oscar award. I agree with what suresh commented. Really LP due were excellent composers in Indian music field. One can not compare their music talent to any composer in Indian music field. What excellent songs they had given. In every film, they could try to give atleast 4 songs best of best.